Given the UK Coalition government’s apparent ‘misuse’ of statistics in a range of policy areas, questions are often raised about the use of evidence in policymaking. Our key concern in this article is how evidence, ideas and knowledge are used (or not) in the policy process, drawing on a series of focus groups with 75 analysts and policy advisers in the Department for Work and Pensions (DWP). The DWP seemed a good place to explore this issue – under New Labour it saw a huge increase in the number of evaluations and is currently the home of ‘flagship’ government policies such as Universal Credit and the Work Programme. 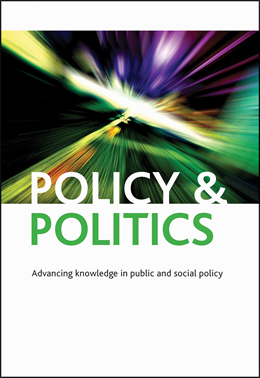 Our article brings together the evidence-based policy-making (EBPM) and ‘policy as translation’ literatures to try to shed some light on the process by which evidence from domestic or overseas contexts is used in policymaking. Although these literatures have developed separately (and tend to remain so) we see both as being concerned with the same issues. It’s fair to say that research has never monopolised the policy process to the extent that policies are formulated solely, or even primarily upon evidence. In this article we draw on a number of studies that consider how evidence may or may not have an impact on the decision-making process. Learning from other contexts, or ‘policy transfer’, is one way of harnessing particular kinds of evidence, focusing as it does on the migration of policies from one jurisdiction to another. However, we argue that to date policy transfer studies have not paid enough attention to the processes involved in this transfer. ‘Policy as translation’ is useful here, seeing the policy process as fluid and dynamic, rather than a linear or rational process, with a focus on ‘de-territorialisation’ and ‘re-siting’ of policies, or ideas. Here we found lessons for understanding evidence utilisation. In the focus groups we tested the usefulness of a number of models with officials, beginning with ‘linear’ models of EBPM and policy transfer and then exploring the ‘processual’ model of EBPM. For the first time we also modelled the concept of policy translation and following discussion with officials present, this developed into our conceptual model of ‘evidence translation’. The article draws attention to what is perceived to be evidence and at what stage of the policymaking process it is used. A surprising finding was that methodology can serve as an evidence selection mechanism, not specifically in terms of an evidence hierarchy but in relation to how particular methodologies are perceived and understood by key decision-makers. 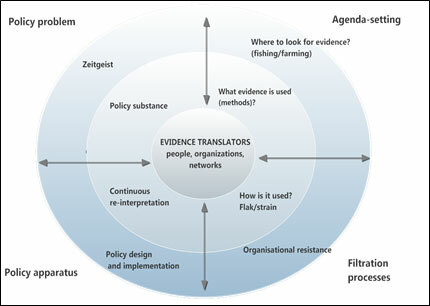 Central to the evidence translation process is the role, skill, knowledge and will of actors as ‘evidence translators’. The model is intended to contribute to an on-going debate about the mechanisms impacting on the use of evidence, ideas and knowledge in policymaking. How this process can be better facilitated requires further exploration and testing both within (and across) academic and policy communities. Jo Ingold is a Lecturer in Human Resource Management and Public Policy at Leeds University Business School and Mark Monaghan is a Lecturer in Sociology, Social Policy and Crime at the University of Leeds. The project on which the article was based was funded by the Higher Education Innovation Fund.